New York City has long been a breeding ground for spies, saboteurs, terrorists, and other threats to the nation and its greatest city. Battleground New York City examines the history of domestic security operations and the people and agencies involved in safeguarding "the city that never sleeps. 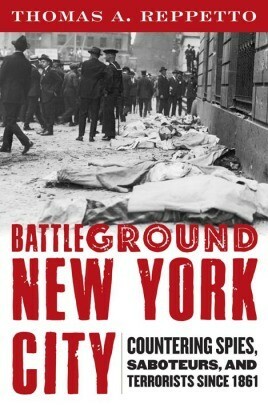 Unfortunately, due to sales rights restrictions, we cannot offer Battleground New York City for sale in your country. Starting with the bloody draft riots during the Civil War, Thomas Reppetto guides the reader through New York City's history, emphasizing the battles against twentieth-century German and Russian spies and more recent ones against Islamic radicals. This book illustrates how, over the course of two world wars, numerous political and social upheavals, and shocking terrorist attacks, the United States developed a complex web of organizations responsible for identifying and neutralizing security risks. New York has been the training and proving ground for law enforcement agencies in developing the organizations, strategies, and tactics now used to protect citizens nationwide. The histories and operations of the U.S. Secret Service, the Federal Bureau of Investigation, the New York Police Department, and other organizations provide insight into recent events and what the United States needs to do to protect all of its citizens. Battleground New York City is the exciting story of the men and women who have dedicated their lives to protecting a city under threat.